It’s here - three of our favourite weeks of the year, the Greatest Show on Earth, the Tour de France! We’d got some fabulous bargains and great bonus items throughout the three-week Tour so why not come and see them at our Sheffield showroom. We’ve got our very own Tour Edition bike builds (Planet X Pro Carbon and RT-80) as well as official, limited edition Tour de France Bottles, Wheel Bags, Bottle Cages, Multi-tools, Bells and Repair kits – also available in unique bundles. New this year are our official Tour de France Balance Bikes to get your youngest mobile and perhaps a head start into the greatest sport on the planet! We’ve also got a Tour Fantasy League for you to compete in. It’s going to be a great Tour! A celebration of the biggest event in cycling, the RT-80 Tour Edition is designed to be fast and comfortable in equal measure and offers a mixture of performance and value for money that is hard to ignore and simply begs to be ridden- fast! The Pro Carbon Tour Edition with SRAM Force 11-speed groupset is the perfect marriage of advanced design, performance and value for money. Our most versatile road bike, it's perfect for all demanding cyclists. (whilst stocks last - sizes 38-46). Get your youngest mobile and give them a head start into the greatest sport on the planet! Official Tour Balance Bikes. (Enter your team before 11.30am on Saturday 2nd July, 2016). Will Chris Froome win for a third time? The 103rd Tour de France starts at Mont-Saint-Michel on Saturday 2nd July and the final stage into Paris is on Sunday 24th July. Team Sky’s Chris Froome is the defending champion and two-time winner looking to score a third Tour de France title. Fresh from recent overall success at the Criterium du Dauphine, Froome heads into his twelfth career Grand Tour in promising form and backed up by a strong Team Sky lineup. Froome is joined in the Team Sky team by: Sergio Henao, Vasil Kiryienka, Mikel Landa, Mikel Nieve, Wout Poels, Luke Rowe, Ian Stannard and Geraint Thomas. Nairo Quintana and Alberto Contador are the two biggest challengers hoping to prevent a third victory for Chris Froome. We look forward to enjoying the Tour with you! 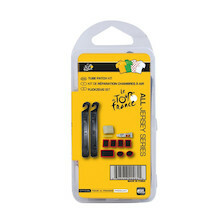 The perfect gift for the Tour de France mad cyclists in your life- even if it's you! 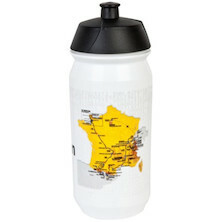 600ml 2016 tour de France water bottle made by TACX featuring the 2016 route map. A classic bit of tour memorabilia for the keen cyclist.